Emily and her father set out on a journey southwards after her mother’s death. On this journey, the father dies and Emily is left in her aunt’s care. Emily’s aunt isn’t the nicest, and she dislikes Emily’s beloved, Valancourt, and takes Emily with her to Italy and eventually to the castle of Udolpho. But the new husband of the aunt is a terrible man and there is no way to escape the terrors of Udolpho. 700+ pages. In my opinion about half of them could have been skipped as they are boring observations of the scenery of France and Italy. And the real story doesn’t start until 30% in to the book. Luckily the last 30% of the book is such a wild tale that it makes it worthwhile. I was not looking forward to reading this as it sounded too scary for my nerves and the start was promising with the mysterious happenings in the cottage. 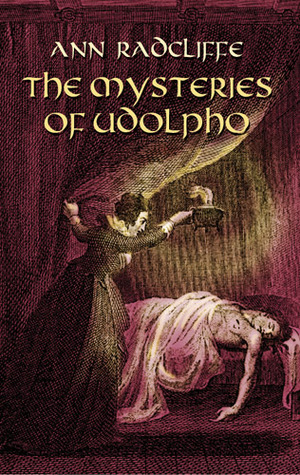 But the whole Udolpho business wasn’t as scary as I thought, but certainly entertaining. The whole fainting women thing was something I could not take seriously. I did, however, love it when the story completely changed and I think the title is very misleading. I’m glad I read it, but I won’t do it again. This was November’s read in Line’s 1001 books reading challenge.